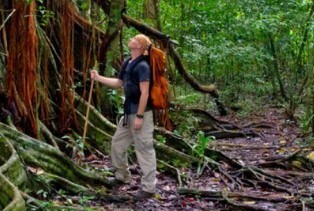 If you never have tried jungle trekking before, don't miss it now. It is nothing strange, dangerous or difficult. You don't have to be young and adventurous to do it. You only need interest in and curiosity for nature. If you don't have that, you will probably catch it. However, you must be fit enough. 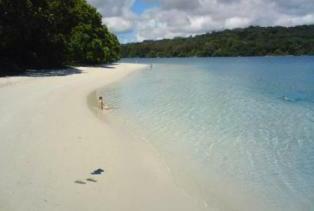 In the vicinity of Ujung Kulon a new form of trekking has developed. You go with former guerilla soldiers in the forest where they once took cover from the enemy. The first time visitor can sometimes be disappointed on how few animals are normally seen. One reason for this is the natural shyness of animals. Even though the animals are not seen, they are often nearby as they hide in the under-story or in the canopy overhead. Nevertheless, a patient observer will see the animals and take their photos as well. * Develop an eye for what is always there, but often difficult to see: the primates and the reptiles. The best way is to choose a comfortable spot and just quietly wait. * Search for things that are all around, but often go unnoticed: butterflies, termites, insects, frogs, etc. * Learn to recognize the sounds of the forest. * Learn to identify the tracks and other animal signs that are left on game trails, for example tracks of Rhino, Crocodile and ungulates. * Light clothes, long trousers and long sleeved shirt. * Leech socks or 2 layers of ordinary socks (nylon socks are better barriers for leeches than cotton socks). * Hat and rain cape (material that breathes is best, because of the humidity; sometimes an umbrella is most comfortable but on tracks through bushes sometimes difficult to keep up). * Sleeping bag for higher altitudes. * Personal medication, antihistamines (for bee stings), malaria pills. * Sun lotion (for river rafting), insect repellent. * Camera. A macro lens is often more useful. * Plastic or waterproof bag for sensitive equipment. * Food for all participants, including the guides. * Tent or plastic sheeting for camps. Even though most snakes are not poisonous, one should be careful and not disturb snakes. If you get bitten, very unusual though, put a pressure bandage above and below the wound in order to slow down the spread of poison. Contact a doctor as soon as possible. * Don't cut rattans and vines, they are essential for the ecosystem. * Don't leave rubbish behind. Tins and plastic don't rot. * If a fire is being lit, use only dead wood and clean the spot before leaving. * Crossing rivers can be dangerous, especially after rains. Most accidents happen in rivers. It is better to wait and try later when the water level drops. * "Take nothing but photos, leave nothing but footprints". * Chose your guide carefully. Small groups are usually nicer than bigger ones. Beware of currents and rip tides. Sunda strait doesn't have the same dangerous currents as along the south coast of Java though. Be careful with open wounds especially from coral reefs. They heal slow and get easily infected due to the tropical climate and the mobile lifestyle a tourist keeps. Clean and disinfect. Betadine is recommended for your medicine kit. In the oceans are many sharks, but the most dangerous ones, for example the Great White shark, prefers a bit cooler water. 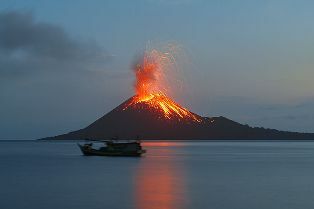 It is extremely rare in Indonesian waters. Common reef sharks are not considered dangerous. Sharks that feel threatened can attack. Always stay calm and leave the area. The barracuda is less dangerous than the shark, but can be attracted by flashy jewelry and speared fish. The Indonesian barracudas are not aggressive as their relatives in the Atlantic though. Sea snakes are the most poisonous of all snakes, but not aggressive. Their teeth are very short and placed far in and can only bite small objects. The saltwater crocodile is an aggressive creature. They live normally in murky estuaries and not at coral reefs and moving waters. Crocodiles are extinct in most rivers or afraid of humans, however common in the Alas River near Singkil. Crocodiles are probably the most dangerous animals in Indonesia, with the exception of the mosquito, when looking at statistics.